A frog located at (x,y), with both x and y integers, makes successive jumps of length 5 and always lands on points with integer coordinates. Suppose that the frog starts at (0,0) and ends at (1,0). What is the smallest possible number of jumps the frog makes? hi can anyone explain the approach to solving this question? It's already explained above. Let me know what doesn't make sense here.. Guess I didn't even understand the question.GMATinsight eraborate on your answer how you applied 5 to get the new coordinate. The question meant that a frog jumps with jumo length 5 units but it lands at a point where the co-ordinates are integers. Since 5 units is diagonal length from origin to (3,4) or (4,3) so these are the only two choices that frog has to jump at. Hi, I wanted to understand, that how did you shortlist the points in the random plane? Lets say had it not been 5 points but 6 points jump, so how should i approach this question mathematically? 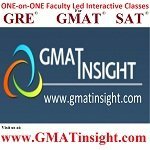 First GMAT Exam: 640 (Q34, V44) - Where to go from here? Calling Kelley (Indiana) MBA Applicants: (2019 Intake) Class of 2021!